You all know the story of Beauty and the Beast, a Prince who lives in a giant castle on the outskirts of some French village is a giant, vain, jerk. He only cares about himself and values only the finer things in life. One night an enchantress, disguised as an ugly woman, comes to his castle to ask for shelter from the storm. The Prince is rude to her because she is ugly so she reveals herself to be beautiful enchantress and places a curse on The Prince, his servants, and the castle. The animated version told this story in a quick voice over with some fleeting shots on stained glass windows. A major improvement right out of the gate on this new movie was the expansion of this scene. We get to see Dan Stevens, who plays The Prince and Beast, getting ready for a ball where only the most beautiful women dance as he watches from his throne. There is a new song in this scene which I believe is titled “You Ladies are hot and I get to pick any of you because I’m rich and awesome.” Then the disguised enchantress interrupts the party and The Prince mocks her before she curses The Prince and his enablers (the servants). This was a welcomed addition because it lets the audience agree that The Prince was a giant douchebag and absolutely deserved the curse placed on him. From there we begin the mostly shot by shot remake of the animated classic. We meet Belle played by Emma Watson with her first number confusingly titled, “Belle”. I know that Emma Watson is beautiful and extremely talented but it is still weird when someone you watched grow up on screen for 10+ years hits a new level of “Wow” and her singing in this movie was really strong. Another welcomed addition was a little more depth to Maurice, Belle’s father, played by Kevin Kline. We learn he is an inventor but not the bumbling fool from the animated version, plus he can sing too! There is also a family depth to him regarding his wife, Belle’s mother, which was interesting. Maurice gets captured, Belle takes his place, Beast locks her away, and the movie hits a real solid hour stretch of perfect. 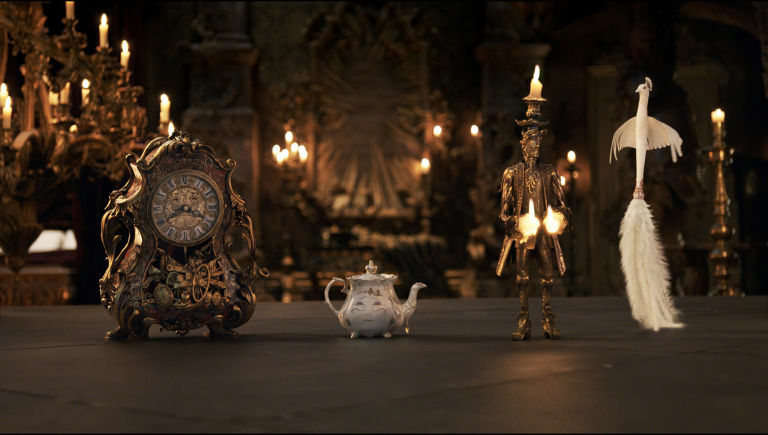 Cogsworth (Ian McKellan), Lumiere (Ewan McGregor) and Mrs. Potts (Emma Thompson) each get some great moments. The highlight is ‘Be Our Guest’ which I wasn’t sure how they’d pull off but it was really well done. The fact that it is actually Ewan McGregor singing that song while doing a stereotypical French accent is downright impressive. The 3D version that we saw was really made for the ‘Be Our Guest’ sequence and I caught my wife and I mouthing the words to it and laughing at some of the dancing kitchenware. The movie continues its natural progression and there was a new song by Belle and the servants about longing to be “in the sun” and free again which was nice. It is also at this point we learn that the reason the servants were cursed along with The Prince is because they enabled him and allowed him to become the jerk he was. Is that a perfect plot explanation? No, but at least it adds some depth to the story and pays off later. I think I’ve waited long enough to discuss Gaston played by Luke Evans. He’s the best. I know he is the bad guy. I know he is an evil character that deserves his fate but early in the film he is a delight. The rendition of ‘Gaston’ in the bar was everything you’d want if you like Beauty and the Beast. LeFou (Josh Gad) is right up there with some of the most perfect casting in recent memory and he adds some layers to the character that resonate towards the end of the movie. My take on Gaston is that he is like Dwayne ‘The Rock’ Johnson if The Rock used his charm and size for evil. Nearly every time The Rock is in a movie, interview, or appearance he’s likable and charming. The type of guy you’d probably want to hang around with and in some cases have his career. That is who Gaston is to this village but instead of doing charity and cranking out blockbusters like The Rock, Gaston wants to force marriages, kill all living creatures, and is plagued by crippling vanity. For the first half of the film, Gaston is comic relief. As the plot progresses there are some really great character moments as LeFou starts to clash with Gaston who goes from conceited, good looking, dummy to something much more dangerous. I probably enjoyed Luke Evans and Josh Gad’s performances the most in the movie. Here is a blazing hot take: If Ryan Gosling can get acting nominations for his La La Land performance then Luke Evans should be considered too. Did that just melt your screen? Back at the castle Belle discovers the curse and is kicked out by The Beast. Beast, of course, rescues her from some wolves which was disappointing in that the wolf attack was a little intense and probably killed any chance of my daughter watching before we can fast forward through that scene. 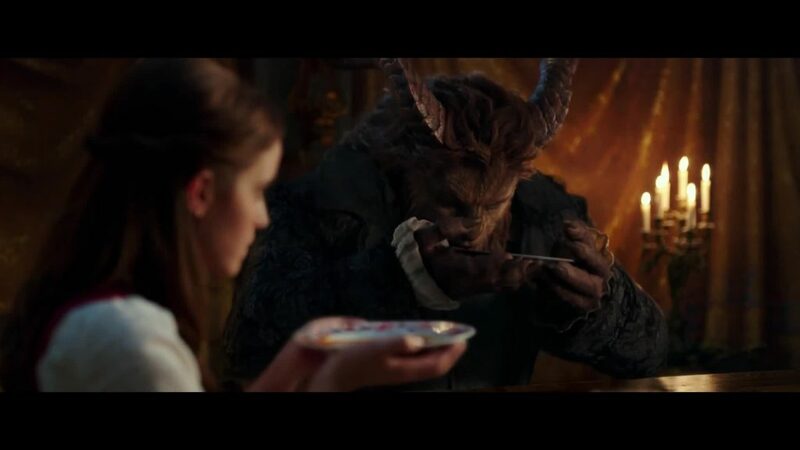 The Beast gets hurt and Belle begins to nurse him back to health. Here is my main criticism of the movie. As Beast recovers from his wolf injuries their relationship starts and you finally get to see some personality from Beast. They added so much to this movie that really worked well but shortchanged this section. There is a reaction by The Beast when discussing Romeo & Juliet that had my audience cackling. There were some dinner scenes that could’ve been played out a bit more too. This was the section in the film where you got to see Dan Stevens bring a lot more personality to the character and role but they reduced it to a 4 minute montage and I would’ve liked to see a bit more. Though Disney did decide it was ok to show how badass Beast would be in a snowball fight against a 120lb girl so… you win some… you lose some. Once again, this version did add some depth to the characters and you learn about both The Beast and Belle’s families a bit more. The Beast lost his mother when he was young and was raised by a mean, vain, and rude father who couldn’t cope with the loss of his wife leading to The Prince having some big flaws. Mrs. Potts explains this to Belle and implies the servants deserved to be cursed for not protecting The Prince or raising him right. It works and also gives us another dead parent in a Disney movie! Not to be outdone we learn what happened to Belle’s mother and no snark here, it was sad. 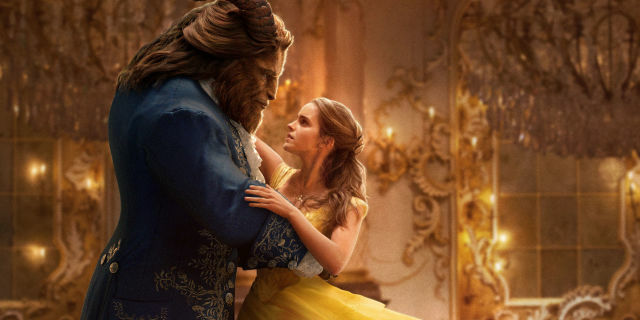 Maurice would never tell Belle about her mother but through some magic the enchantress left to torment The Beast, Belle is able to visit her childhood home where she learns her mother’s fate. Belle’s mother contracted the plague when Belle was an infant and told Maurice to take her away before it took Belle’s life too. That is why Maurice always speaks of Belle’s mother as the strongest and bravest woman he’s ever known, explains why he is so protective of Belle, and why they live in a small “safe” village. Next the “Tale as Old as Time” dance occurs and Beast then allows Belle to return to her father who Gaston is trying to have committed. Beast gets a new song about letting Belle go which wasn’t in the animated version, but again, wasn’t a bad addition to the film. 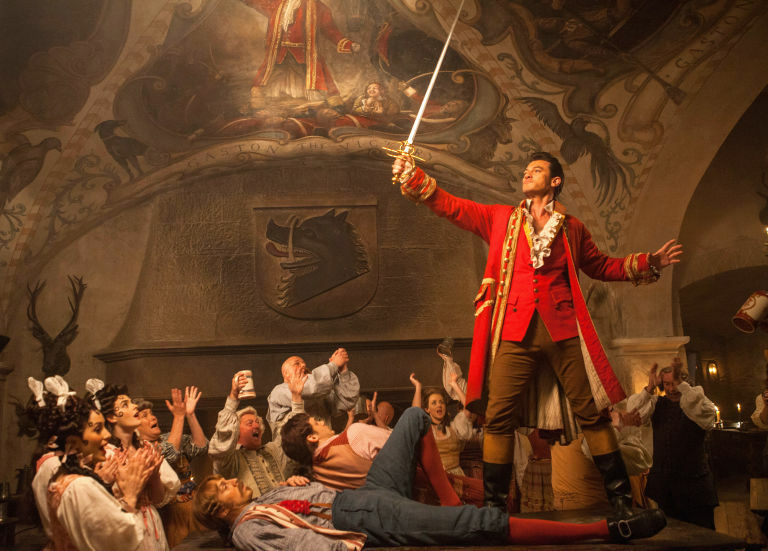 When Belle reaches the village and reveals the Beast in an effort to save her father, LeFou begins to turn on Gaston as Gaston reaches full villain mode. When the villagers, led by Gaston, attack the castle there is great CGI “battle” between villagers and your “Rooms to Go 1837 Collection” that was serious without ever becoming violent or too intense. The battle between Beast and Gaston is a bit darker though never more violent than what you see on the news at 5pm. When the Beast is killed but returns because Belle loved him his transformation was slightly funny for exactly one reason. Dan Stevens is a good looking guy but he looks absolutely ridiculous in his big, true love turn around reveal to Belle. The wig is just hysterical. Maybe it’s because I loved The Guest and watch Legion so it won’t bother anyone else who sees the movie but there is a huge part of me that thinks Belle wouldn’t swipe right if The Prince’s profile came up on a dating app because of that damn hair. Crap! I feel like I just missed the entire point of this fairy tale about beauty not being found on the outside. Luckily, in the grand finale of everyone coming back to human form and dancing as a town they get his hair correct and it doesn’t look like an 8th grade stage play hair piece. It is a great two hour movie and fans of the animated version will love it. The new songs and character moments add some new depth to the story and only enhanced my enjoyment of it. The casting was absolutely perfect from top to bottom. The singing was well done, the costumes were incredible, and the special effects were definitely up there as far as quality goes. I know this movie doesn’t need any help from me to make a ridiculous amount of money but I’d recommend it to fans of Disney and anyone with kids 4 and up (assuming they aren’t scared of wolves). I am a huge fan of these Disney movies thanks to my wife and daughter and I had some extremely high hopes for this one. I thought live action Cinderella was a huge miss and the Jungle Book was incredible with the effects but pretty mediocre as a film. Beauty and the Beast delivered and met my ridiculously high expectations. I look forward to seeing it again. Now bring on The Lion King! This entry was posted on Tuesday, March 14th, 2017 at 12:15 pm	and is filed under Film, News. You can follow any responses to this entry through the RSS 2.0 feed. You can skip to the end and leave a response. Pinging is currently not allowed. I dont like tom hanks. I’m glad they stayed true to the original. Disney knows that if they want it to sell and do well, then follow the formula of the predecessor (see The Force Awakens as a plot remake of A New Hope). If it’s not baroque, don’t fix it. « Sleepless Starring Jamie Foxx Drops To Blu-ray, DVD and Digital HD !! !